I just drew this little cartoon for my friends over at Dell. Feel free to print it out, use it to make t-shirts or whatever for your own personal use etc etc. But that’s what inspired the cartoon. I know Dell is a global company. I know they’ve got big plans for China and India. That being said, I don’t think one can overstate JUST HOW MUCH of Austin’s culture is hard-wired into Dell’s company DNA. A big part of why so many people work for Dell is quite simply, it allows them to live in Austin. And although Austin has doubled in size in the last decade or so, at its core it remains what it’s always been- a pleasant, genial, small college & government town. Austin is a fabulous place. People live there because they love it. The locals are very passionate about the city they call home. After finishing college at UT Austin, Michael Dell could have set up his company anywhere he wanted. He could have easily have moved it back to Houston, where he grew up. Or maybe the West Coast. East Coast. Whatever. He chose not to. Does Austin have a unique vibe, a sensibility, a set of values that can be exported globally? The way, say, Apple exports Californian culture globally, or Starbucks exports Seattle culture globally? I think it does. I think it can. And I think Dell’s the right company for the job. [NOTE TO PEOPLE WHO WORK AT DELL:] Remember where you’re from. Austin, Texas. Love it. Cherish it. Never forget it. Rock on. Too cool. Having spent 4 years at Dell and then having to leave Austin in conjunction with my choice to leave the company in early ’06, I am the poster child for this post! While we feel pretty settled in DC now, I have come to realize that you never get over Austin. Ever. Lionel Menchaca & Co are certainly making the Dell brand something that millions in ads never could – personal. And maybe a little weird too. I like the weird/wired justaposition. I spent a week in Austin at a PPA conference a few years ago and had a fantastic time. The town has a definite unique vibe. I raved about it so much my daughter(recent college grad) is planning to move there next spring. Then I will have an excuse to visit there more often. Wahoo! 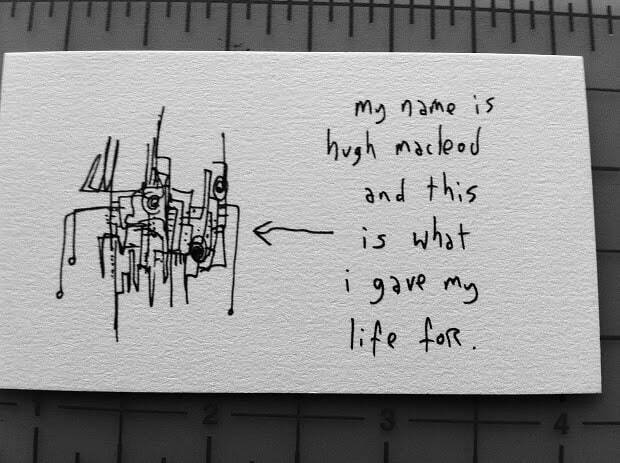 Brilliant, Hugh! See you next week, right here where we’re keeping Austin weird. That’s a great challenge to lay down. Personal and provocative. Some people will say that their products won’t ever be weird but they’re missing the point. Austin weird is not the same as worldwide weird. Like a lot of us in the area, I’m a huge fan of Austin. Besides that, I like your explanation behind it. I think you’re onto something. 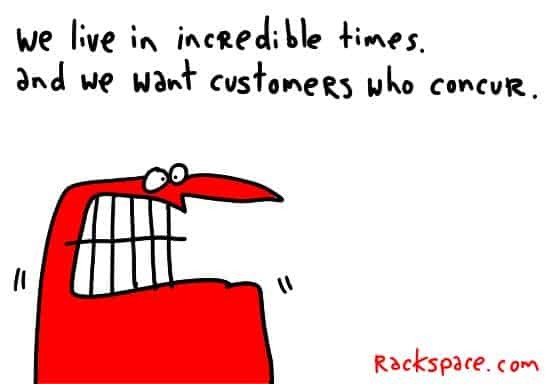 I’ll share this with the the broader Dell team. I’ve been reading your stuff for a while and never been compelled to comment until this genius post. It’s got a “you can take the girl out of the trailer park, but you can never take the trailer park out of the girl” flair to it. Does this describe how I feel about Dell? No. But as a student of urban geography – it speak leagues to the impact surroundings have on corporate culture. I wonder what kind of company Dell would be if they were from Toledo? When deciding to go weird taxes are not a consideration. Sorry. Interesting question. Interesting thought experiments along the same lines could really be a useful tool for companies to figure out their value statements. 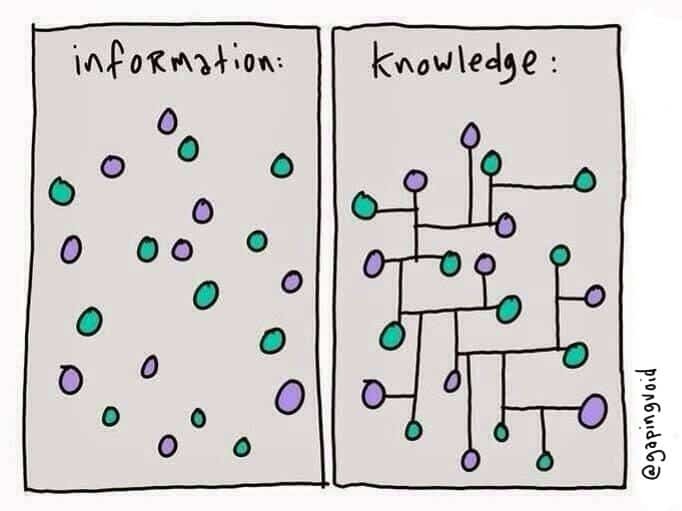 Far more interesting than the cr@p they frame and hang in their boardrooms. Let’s not forget that a lot of people who work at Dell live in Round Rock or beyond. A place where you see bumper stickers that read “Keep Round Rock Normal.” I know people love the Austin connection, but let’s not overstate it. Dell’s headquarters looks very corporate (security guards at the reception desks, cubes galore, buildings that all look alike, warnings about bringing weapons on campus) and not too unlike most of their PC-selling competitors to tell the truth. They hire a lot of MBAs from the nation’s leading business schools, have highly-automated factories, hire Ph.D.’s to secure patents that hang on the walls, and are masters at negotiation with overseas and local suppliers to make possible their lean manufacturing model. They got into gaming by buying a company that sold edgy products. Dell doesn’t create markets, they proudly commodotize them. Don’t get me wrong. It is a great company and I have lots of friends and colleages that have made excellent careers in and around Dell. However, there isn’t much about Dell that is the funkiness that Austin is known for (in one person’s opinion). Hmmm …. I’m not too convinced. If the coolest thing you can say about Dell is the reflected glory that they come from a cool city, I think the whole effort is in trouble. Surely there are some *intrinsic* properties of Dell that I should care about? Since when has “weirdness” been it? Are they really gonna go head-to-head against Apple as the choice of the “Creative Class”? This annoys me because it’s too much like the old, fake, advertising : glamour and desirability stuck on the side, not baked into the product. Phil Jones, yeah, you’re talking about “Borrowed Interest”, a term frequently used in advertising circles. Though this is not really about that. I’m interested in DELL as a social entity, as much as a producer of products. To me, the social context is where everything begins. The product comes after the fact. Still, I admit I was harsh. You had a right to snap. OTOH I’m proud to be a geek and care about the real products, not just the hype. But go on. Convince me. I see how wine is social. I see how bespoke tailoring is a high-touch service compatible with blogging. I see how Microsoft used to be a world changing company and have aspirations to get their mojo back. But – except, after reading Howlett, maybe in the field of accounting – I don’t see how weirdness turns up in Dell’s social context. Maybe there’s a pent-up yearning there. For employees who live in Austin and don’t like to feel they’ve sold out to a staid enterprisey corporation, this is a flag to rally around; a call for Dell to be the kind of radical, cool, interesting company they’d really like to work for. Obviously, I wish them and you luck. 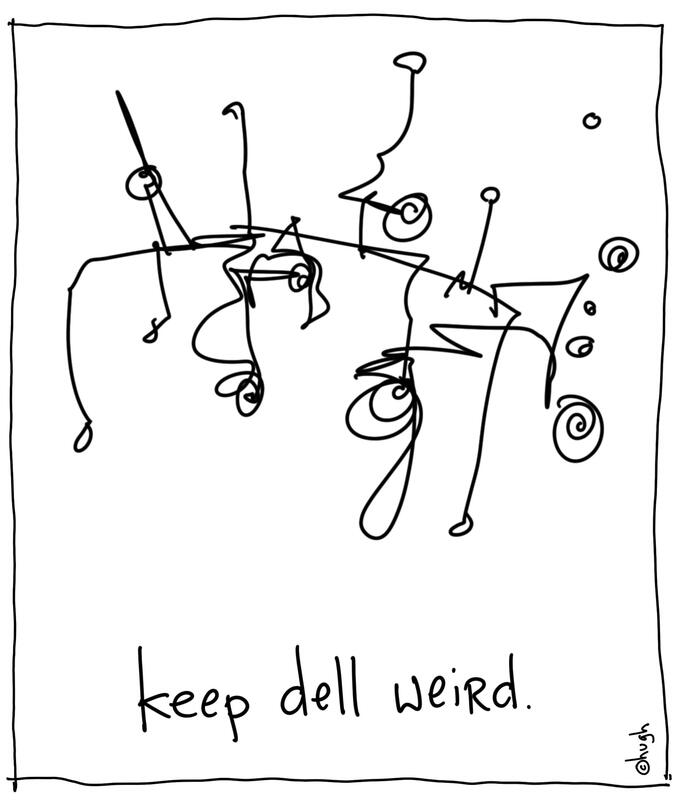 But I would also like to see the weirdness come out in products. Yeah, I slept on it, and in the morning decided you deserved a more thoughtful answer. Funny how you interpret comments differently after a good night’s sleep. 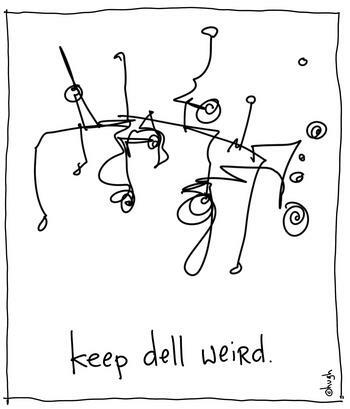 The thing about the “Keep Dell Weird” idea is, it’s not an advertising campaign for the external world… a “message”, as it were. It’s more of an idea for the people who work there to think about. Who they are, where they’re from, and what they want to do with their lives. Having spent a few years at Dell in Austin spanning the bubble bursting a handful of years back… I love this cartoon, hugh. However I can’t help but think that while a lot of the foot soldiers at Dell are Austin natives, there are many transplants who bring a different mindset to the firm. While Dell was growing boundlessly in the late nineties, they systematically recruited seasoned “professionals” and “managers” to stabilize what was feared to be on the verge of scaling chaotically. They wanted these West Point alums, these Motorola vets, these IBM management science wonks to establish order over what was a vibrant, kwan-like environment… not to mention back then, pre-PC-price wars, raking in cash for Dell while skewering its competition was easier and more palpably rewarding than it is today. Like many post-boom companies… Dell is now being driven by folks more prone to 9 to 5 work days than years bygone… but thankfully they’re love of Austin has kept them around. Perhaps they only gel with the weirdness after hours, and the lackluster corporate culture starves itself of 9-5 expression of local passion, reserving for purely leisure hours. I also know that Austin faithful are wary of the gentrification that is occurring, the importation of East and West coast yuppification. I refer to this scar as 4th street culture. Austin’s weirdness emanates from 6th street… from hill country… from the Salt Lick… do not abandon the old standbys as you embrace the esoteric. Hold on to it. All that rambling as context and colour… I think what I am getting at is…Dell itself represents a modernitizing force on the city that inspired the Keep Austin Weird slogan. How does Dell stop being a perpetrator of the demise of weird, and help be a globalized gesticulation of it? I am not sure slapping pretty colors on staid hardware will do the trick. I think they know this already too… it shall be interesting to see what emerges.